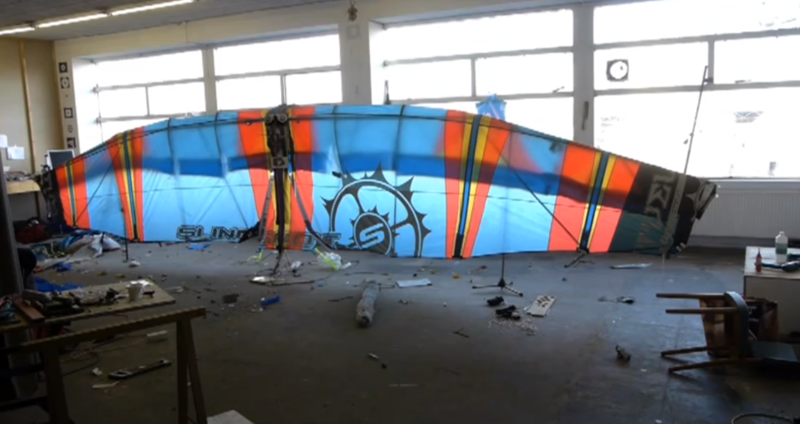 March 23, 2012 - A Dutch man named Floris Kaayk who bills himself as a filmmaker and animator recently revealed that the viral video "Flying Like a Bird" was an elaborate hoax spanning several months and consisted of at least 14 videos systematically uploaded chronicling the "development" of a set of motorized "wings" that would enable him to fly. Image: The da Vinci-esque wings featured in the following video ended up being nothing more than an elaborate movie prop - with Dutchman Floris Kaayk's video we learn volumes about the gullibility of modern society and perhaps given a warning about how easily manipulated we are as a society. While some will claim Kaayk's hoax was extremely elaborate, it is nothing compared to what Western civilization is subjected to by their governments and the mass-media on a daily basis. Video: Another viral video quickly racking up millions of views, "Flying Like a Bird," while decidedly more harmless than the Kony 2012 scam, duped tens of thousands of viewers for the simple fact that they lack any modicum of critical thinking. And while embarrassment results today, tomorrow it can be another war we are all lied into fighting, because people dare not, or worse yet, know not how, to question the world around them. Based solely on a series of videos and corporate-media articles covering his efforts including one found in the Financial Times' German edition, hundreds of thousands of people around the world concluded that Kaayk's literal flight of fancy was "real" - not based on solid evidence or confirmed reports of his alleged success, but based rather on the elaborate nature of his documentation and the appeal to authority he made with both convincing references to scientific knowledge and the "mainstream" coverage he had received. 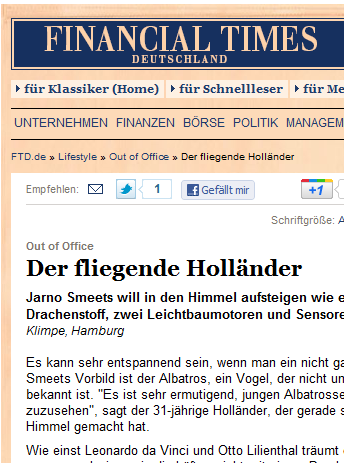 Image: A screen shot taken from the Financial Times Deutschland covering the fictional character Jarno Smeets and his dream of "flying like a bird." One wonders what sort of "fact checking" goes on over at Financial Times, and if that is the reason reality is so horribly distorted by the West's corporate-media. When Wired magazine checked "Smeets'" background, they concluded correctly that the man did not exist - and would later find out his real name was Floris Kaayk. Even as Kaayk revealed on Dutch television his true identity and the nature of the hoax, there were still holdouts arguing that the video was somehow real. Kaayk's hoax was conducted as an experiment with online media and provides for us a valuable lesson in both critical thinking and the vulnerable nature of a profoundly ignorant and immensely impressionable population. A single man with limited resources was able to convince vast numbers of people that he was able to flap his wings and take flight like a bird. 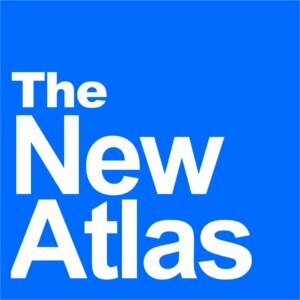 Imagine what an organization, a Fortune 500 corporation, or even a national government could accomplish with endless resources and entire media networks brimming with "experts" at their disposal. In fact, don't imagine, and instead consider another online media experiment, Kony 2012 or the US-engineered "Arab Spring" that proceeded it, both coming out of the US State Department, and both as fantastical in nature as Kaayk's "Birdwings" story. Like Kaayk's "Birdwings," many never bothered to confirm the facts, do any in-depth research, follow the money, study the characters involved, or reserve judgement until all the facts were forthcoming. Instead, their better judgement was distorted by emotions and appeals to authority, be they the corporate-media or "Wikileaks." For "Birdwings" it was the emotional satisfaction of believing human technology has granted us the ability to fly like birds - a dream we've all most likely had since childhood. For the "Arab Spring" we wanted to believe the force of good, the power of the people, and "democracy" had begun to spread to the four-corners of the world, that the Arab people were rising up both against their own dictatorships and the corporatocry in the West that propped them up for so long. And more recently in regards to Kony 2012, we were taught to hate a man we've never seen before and emotionally desired his arrest at any cost - even if it meant another foolhardy military adventure led by the West. Of course, for those who shelved their emotions and instead immediately set to work objectively examining the facts, following the money, and drawing conclusions only where a satisfactory amount of evidence existed, these ploys were uncovered and exposed. 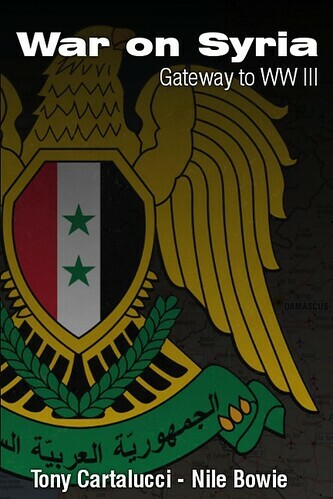 While the Kony 2012 scam collapsed spectacularly, others like the "Arab Spring" continue on in spite of the facts. Hopefully, as humanity is duped over and over again by their malicious, manipulative governments or by harmless hoaxers like Floris Kaayk, we will collectively tire of being made perpetual fools of, and finally teach ourselves the finer points of logic, reason, objectivity, and critical thinking. Perhaps the next fantastical, socially transforming, paradigm shifting event that is placed before us will be met with healthy skepticism and due diligence in both research and objective observation. Or perhaps better yet, we will tire of others handing us our dreams in the first place, and begin down the path of making them a tangible reality ourselves.